Successfully Added Colorfun Cell Phone - Slim Profile Touchscreen Media Phone to your Shopping Cart. Slim bar style touchscreen two band (900MHz, 1800MHz) cell phone with colorful keypad and display. This easy to use entry level mediaphone is a nice little mobile phone with a modest price. 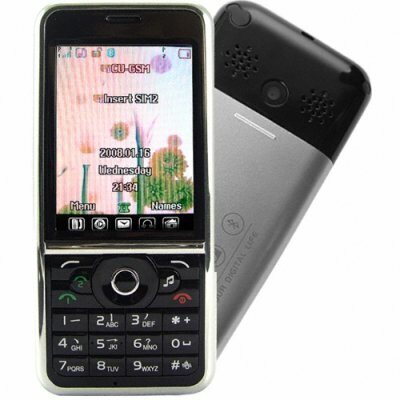 This cellphone is one of the few slim profile, easy to use dual SIM touchscreen phones on the market today. It has a simple to dial keypad, active buttons for either SIM card, and a rich featured contact manager/phonebook. At the same time, this model also has many of todays most popular media phone features including MP3/MP4 player, FM radio, and wonderful software tools including a WAP web browser. Who is this phone good for? Do you need a reasonably priced, stylish media phone? Do you want to own a phone with a one of a kind feature that will get you out of trouble with the wife when you are at the pub? ** Then this phone is for you!! Notable features include an option for always on vibration, the "color-alive" multi color light show on the casing of the phone, 64 chord stereo speakers, and the unique background sound addition manager. **In particular, the background sound manager allows you to make calls with background sound files playing simultaneously. Need to sound like you are on the Metro while you are really at the pub with the guys? We got you covered!! This is a wonderful cell phone for the re-sale and internet storefront market. Order your stock now as this is a limited time product. Proudly brought to you by the leaders in wholesale direct from China electronics, Chinavasion. Slim profile, budget priced touchscreen dual SIM media phone. Features colorful keypad, display and optional always on vibration for added fun. Has colorful "color-alive" option to have the sides of the phone blink different colors with incoming calls and messages. it´s a really good cell phone , everything works good .